The eGo II Twist 2200mAh battery is an advanced battery that allows you to change the voltage of the battery by twisting the bottom. They have a huge capacity which will give you hours of vaping pleasure between charges. This battery also comes in a brilliant array of carbon fibber colors and is 510/eGo threaded so it will work with standard eGo battery chargers and any 510 eGo threaded clearomizers. This battery has a total of 8 voltage settings available ranging from 3.3v - 4.8v in increments of 0.2v. Raise the voltage by twisting the knob clockwise and lower the voltage by twisting the knob counter clockwise. The higher the voltage, the more vaper you get. Just take care that your clearomizer can withstand higher voltages when turning the voltage higher than 3.7v to ensure that you don't burn out the wick in your clearomizer. Charging the eGo II Twist will take approximately 4-5 hours. The initial charge should be for 8 hours to set the memory of the battery. From then on, you should NOT charge for more than 5 hours at a time to maintain the battery health. 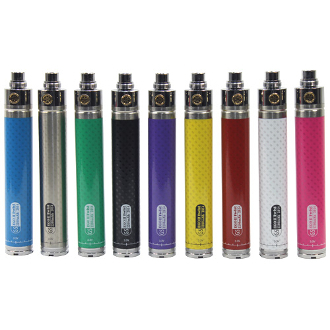 Life of the battery depends on use and charging habits but typically the eGo II Twist 2200mAh has a 300 charge lifespan and a fully charged battery will get you approximately 2000 puffs, depending on the depth of your inhale. It comes with a stainless steel beauty ring to fill in the gap between the battery and a 510 threaded battery. Not only does this add to the overall look of the battery, it does offer added protection and makes breaks less likely. *Though the beauty ring does add protection from breaks, you should still take precautions to prevent dropping or bending, as the battery can still suffer damage from trauma. Charge for NO MORE THAN 5 hours after the initial 8 hour charge. TO USE: To turn ON/OFF, press the button rapidly 5 times. The button will change color to indicate the level of life the battery has. White: 100-70%, Blue: 70-30% and Red: 30-0%. Remember: Never leave your battery unattended while charging.